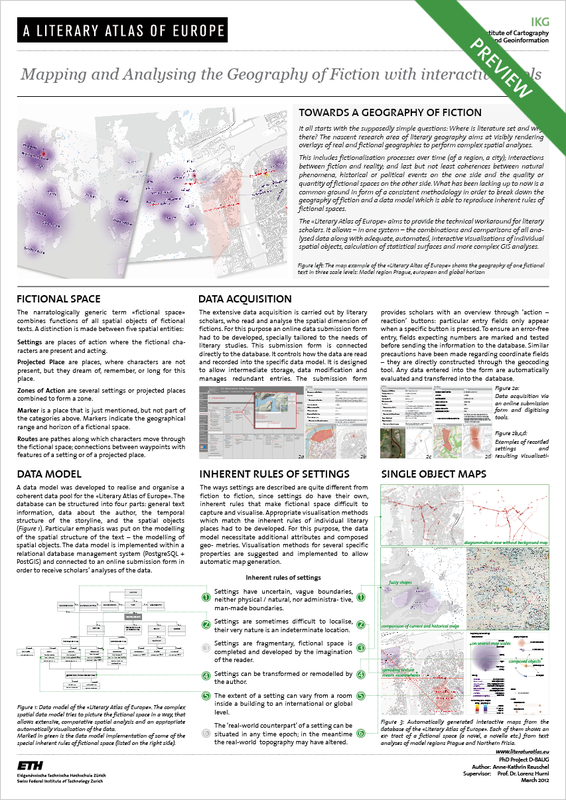 In connection with a presentation of the ongoing doctoral thesis of Anne-Kathrin Reuschel (which covers all technical and cartographical questions of the »Literary Atlas of Europe«) a poster has been prepared that summarizes the atlas project. It deals mainly with data modeling and data acquisition as well as with visualisations of single objects of fictional spaces. Comprehensive descriptions can also be found on the following websites: data model, data aquisition and single object maps. The poster can be downloaded as pdf version at the bottom of this side. It all starts with the supposedly simple questions: Where is literature set and why there? The nascent research area of literary geography aims at visibly rendering overlays of real and fictional geographies to perform complex spatial analyses. This includes fictionalisation processes over time (of a region, a city); interactions between fiction and reality; and last but not least coherences between natural phenomena, historical or political events on the one side and the quality or quantity of fictional spaces on the other side. 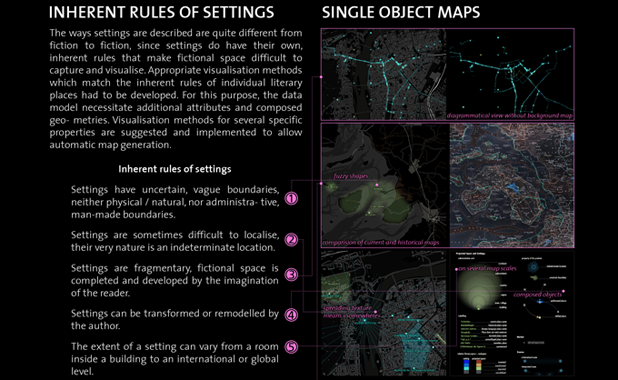 What has been lacking up to now is a common ground in form of a consistent methodology in order to break down the geography of fiction and a data model which is able to reproduce inherent rules of fictional spaces. The «Literary Atlas of Europe» aims to provide the technical workaround for literary scholars. It allows – in one system – the combinations and comparisons of all analysed data along with adequate, automated, interactive visualisations of individual spatial objects, calculation of statistical surfaces and more complex GIS analyses.